Home » SCIENCE-TECH » This Will Make Your Clothes Bright White And Fresh Like Spring. No Chemicals, Cheap And Easy! Doing the laundry can be a tiring, boring, and annoying task, and despite all the efforts, certain stains just won’t go away easily. On the other hand, good commercial detergents are just too expensive. 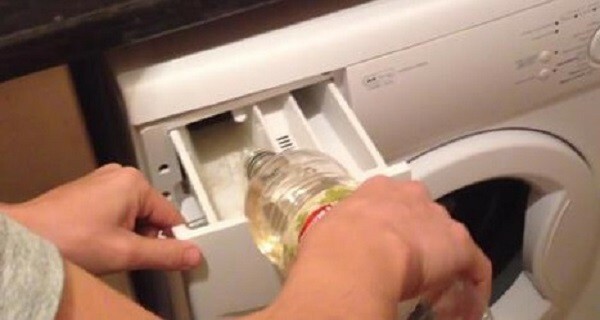 Add some white vinegar to a cup of hot water, and soak the dirty clothes in this solution. Leave them thus overnight, and wash them the next morning. In order to wash the underwear or swimwear, you should add 6 tablespoons of vinegar to the hand wash, and soak them in this mixture for 30 minutes. Add 6 tablespoons vinegar to the hand wash. Let it soak for half an hour. This amazing ingredient neutralizes unpleasant odors, so its use will get rid of the bad cigarette smoke. Remove the stains of sweat or deodorants on your white clothes using white vinegar. It can also be used as a fabric softener, and you should just pour a bit in the designated compartment of the washing machine. You should pour ½ cup of white vinegar on the clothes before you place them in the washing machine. In this way, you will boost the effects of the laundry detergent, you will eliminate soapy residue after the washing, and you will protect the color of the fabric. In order to get rid of the residue of powder detergents after washing, add ½ cup of it before you put the clothes in the washing machine. White vinegar an also help you get rid of the fuzz from certain fabrics, as well as the animal hair. You can avoid harmful chemicals and use white vinegar only to clean and descale the washing machine.